1. Individual differences in the development of L2 oral fluency and inhibitory control in the study abroad context for L1 English learners of Spanish. Sapna Sehgal. 2. 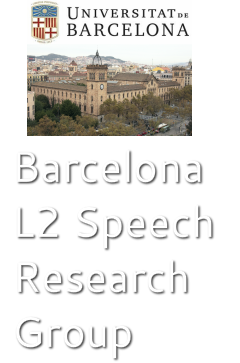 Perception of English L2 sounds by trained Catalan learners. Angelica Carlet. 3. Eye fixations on function and lexical words in L2 English during the processing of bi-modal input in captioned films. Joan C. Mora & Eva Cerviño. ﻿1. Eye fixations on function and lexical words in L2 English during the processing of bi-modal input in captioned films. Joan C. Mora & Eva Cerviño.